I am not a professional math guy, contrasted with my friend Ron. I just dabble. As an example to take the sting out of Big birthdays ending in Zero (most recently for me the Big-6-0), I prefer highlighting prime ages, of which I’ve had 16 so far and another four should be coming during my life expectancy. My two friends Tracy and Michelle both turned 30 recently and I had the opportunity to explain the magic of 30: 29 and 31 are prime. Two prime ages surrounding an age usually dreaded. And this year I turned 60 having solace that 59 and 61 are prime. It is tempting to imagine that this might happen for ages divisible by 30. Alas 90 only works with 89. Simple enough, but Tracy asked whether I had any prime ages in a prime year? And so I went to work on that. I have never turned a prime age in a prime year. (My friend Ron points out this is self-evident because I was born in an odd year, thanks Ron!) But I have been a prime age during three prime years (for me the magic window is January 1 through August 28): age 41 in 1993, age 47 in 1999 and age 59 earlier this year 2011. Won’t happen again in my lifetime. I have it set to let me work for 28 minutes and then a 2 minute break. 2 minutes is just enough time for me to do a trip around the building, including a couple of flights of stairs. On Sunday morning I was a faculty marshal at Freshman Convocation. I am totally smitten with academic tradition and rarely miss an opportunity to wear my cap and gown, but more importantly reflect on what we ought to be doing at an university. These ceremonies help me remain focused on students and the remarkable experience that a college education ought to be. Our job is quite simple. The doors of the arena open at 9:30. We occupy assigned positions, welcoming students, family and friends, working mostly on separating the students–who sit on the floor of the arena and in the first few rows–from family–who sit anywhere else. At 10:15 we reassemble in the basement. We are suppose to line up down a hallway, so that we can be counted and split into two groups that will enter from the two sides of the building, meeting in the center aisle and proceeding up to the stage. This seems so simple anyone could do it. But not the average faculty marshal. I was at the head of the line and Kent Guy, a colleague from history, behind me. That was it. We had a delightful conversation around the herding of cats. Eventually though they were herded. The convocation follows the same pattern each year. Introductory words from University Marshal Ron Moore, a welcome from the ASUW president, remarks from Dean of Undergraduate Academic Affairs Ed Taylor, some focus on faculty from the Provost (Interim Provost Designate Doug Wadden played this role), and then a speaker. This year’s was our new President Michael Young. The coming rain held off just long enough for me to walk back across campus. Tobae, Luna and I began today by visiting one of our family classic hikes, Dickerman Mountain. (A pet peeve: it is Dickerman Mountain, not Mount Dickerman…). For many years this was our traditional Mother’s Day Hike, always encountering snow at about 4000′. The trail gains 3800′ from the 1900′ trailhead, and so there were always four ~1000′ M&M stops for Daniel and Mark when they were little. In the days of analog cell phones, we would call Tobae’s mother and my mother from the summit. Not possible anymore, that’s progress? Eventually Dickerman Mountain was supplanted by Mother’s Day skis of Mt. St. Helens south flank, but there are still one or more ascents of Dickerman each year, with the trailhead just a hour from the house and none of the traffic hassles of North Cascades, Stevens or Snoqualmie. With the immense snow pack this year, the conditions seemed perhaps a week post Mother’s Day in a normal year, snow level a bit higher (making the crux, crossing the creek at 4100′, much more sporty with a snow bridge weakening daily). My knees are not the best (but much better than 10 years ago), so Tobae, the Energizer Honey, and Luna separated from me at 3400′. And I eventually stopped for lunch and turned around shortly after the snow bridge crossing. Tobae and Luna of course summitted and had caught back up with me not too far above the trailhead. It was a gorgeous day and we all had a great time. Arriving home at 5:30, we got unpacked, and I scanned Facebook. What a vicarious thrill: Tyler Farrar won Stage 3 of Tour de France. 30 years ago when I met Tobae, her housemates were Tyler’s parents Ed and Cindy Farrar, and while we don’t see them often, they are dear friends. A huge thrill. I’ve been remiss in getting the Tour recorded, but that is now fixed. But we will watch it later. Our official summer drink, Mint Juleps, are ready. It is more comfortable outside. Potatoes are in the oven, salads are made, and so out to the deck. I’ll get the steaks going in awhile. 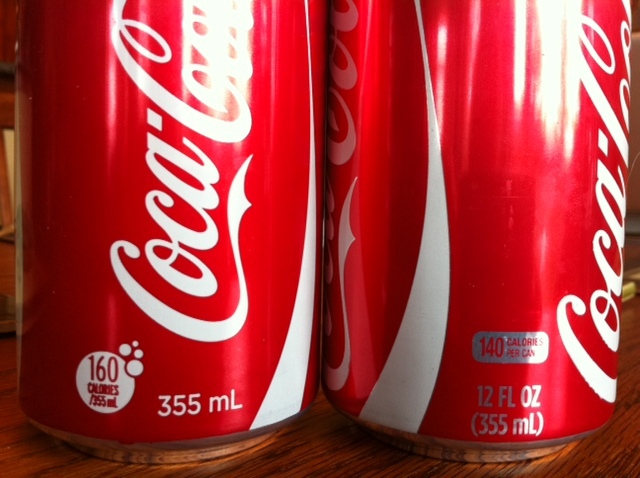 I made a discovery yesterday: Canadian Coca-Cola is different from the US version. A bit of web searching revealed that this is not new information, for example this article.